Why ban phones from the classroom when you can harness them? Bootstrapped startup ClassPager today launches its Twilio-powered SMS system that lets teachers and professors efficiently send their students quizzes and reminders, and receive answers and feedback. ClassPager can re-engage bored or shy students, and show teachers who’s falling behind. The 30-second set up provides a classroom code students can text to participate, so teachers and students don’t actually have each other’s phone numbers. That means better grades with no prank calls and no inappropriate advances. Let’s say a teacher wants to check if students understood an in-class math lesson. They use the ClassPager web interface to send a question such as “Solve for X in X^2 = 36”. Students text back their answers or ask for help. Teachers check the answers through web interface, and get notifications of students who are consistently wrong. Teachers can also send homework questions, remind students of quizzes or supplies to bring, or ask them to vote on a class decision. ClassPager is much easier and more private than trying to manage SMS with dozens of students manually, and provides better insight into class and individual student performance that traditional teacher workbooks or spreadsheets. ClassPager is free for students, and since it works over SMS, even feature phones can use it. Students only pay their standard text message rates. If that’s still too expensive, founder Mahipal Raythattha tells me smartphone owners can use ClassPager through free texting apps like Pinger’s Textfree or textPlus. Feature phone owners who want to avoid fees currently have to go through third-party web-based SMS. Raythattha was formally a teaching assistant at CalTech. He found that “no matter what level you’re at, teachers have problems assessing every student” and making sure no one slips through the cracks. He explains “there are other old school polling methods and software and methods — students raising their hand, clickers, products that aren’t designed for education, but they make it difficult to look back at the data about how students are doing”. By taking advantage of the “bring your own device movement”, there’s no hardware costs and students are unlikely to forget the device they use constantly throughout the day. There is competition from startups like remind101, but ClassPager aggregates answers in addition to broadcasting questions. You could say ClassPager is a niche product, but there are a lot of classrooms out there. Top Hat Monocle provides a more advanced solution aimed at colleges, but charges students $20 a semester if students want to track their results. The two-man ClassPager team hasn’t done any marketing but its pre-launch beta has virally spread to over 1000 classrooms, with 500% month over month growth. 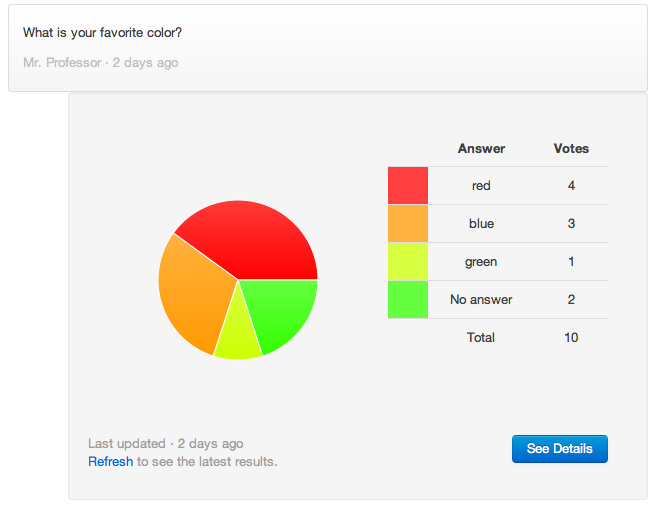 Next it’s working on more polling capabilities, native iPhone and Android apps, and a web interface for students. The ultra-lean startup is built on Twilio, so it pays just $0.01 per SMS. ClassPager offers unlimited communication with one 25-student classroom for free, and unlimited classrooms of 75 or 200 students cost $10 or $20 a month. Right now, ClassPager is selling directly to teachers, trying to score some of the $400 a year the average teacher spends out-of-pocket on classroom resources. Eventually it hopes to sell to school districts and universities, where it can provide overarching analytics. I recommend the company release apps for parents to track their students’ progress, which could be paid or could promote affiliated tutoring and test prep services as additional revenue streams. Lackluster education is a huge problem. If schooling doesn’t evolve, more kids will tune out, and there won’t be the talent necessary to fill tomorrow’s highly skilled jobs. I think ClassPager is a great idea. Take the devices students are addicted to and make learning interactive. It’s hard to sleep in the back of the class when your pocket’s buzzing.